The AFS-01 is an automatic shut off liquid nitrogen dewar filling station for standard liquid cylinders. The AFS-01 is designed to fill portable low pressure liquid nitrogen dewars from a pipe system or bulk tank. The AFS-01 uses a cryogenic sensor to detect a “full” condition. Once full, cryogenic valves shut off the fill cycle maintaining the fill pressure of the liquid cylinder. The liquid cylinder is ready for immediate use. Reduce Losses – Eliminate overfilling and loss of LN2. Improve Employee Safety – Create a safer work environment with fill shut off timer, vent safety interlock, and emergency stop. Workforce Efficiency – Eliminate wasted labor and downtime. Cost Savings – Save money by eliminating the need for dewar deliveries. Easy to Operate – Allen Bradley PLC controls. Start the process and it will run itself. Adjustable Settings – Adjustable timeout timer and cryogenic sensor threshold. Visual Alerts – Status indicator light and audible alarm contact. 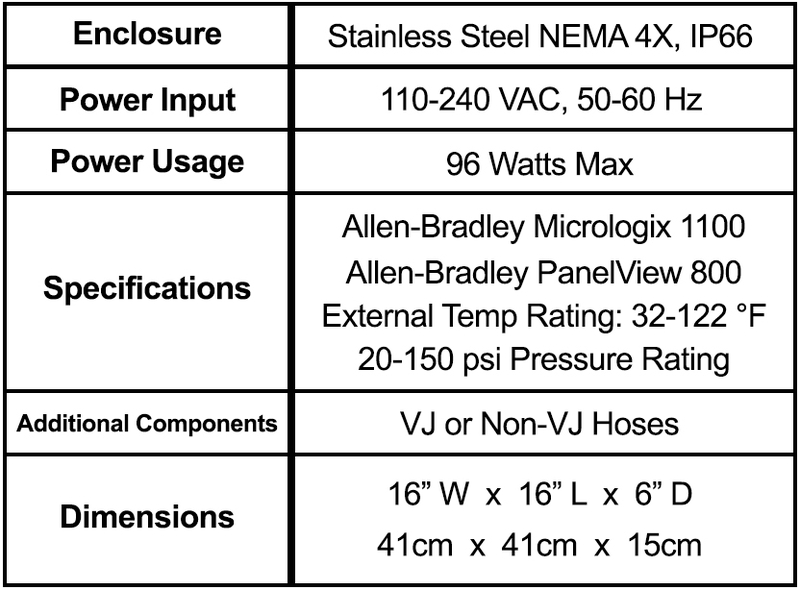 Safety – Vent interlock, max fill timer, EMO switch, and fail close valves. Indoor or Outdoor Installation – Fill liquid cylinders where it is most convenient.